I made this pasta for a minor recipe contest on mixingbowl.com but didn’t win. 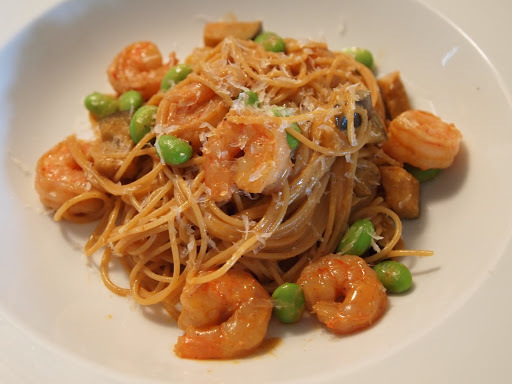 It’s a creamy tomato based pasta with shrimp, edamame and eggplant. I don’t like whole wheat pasta very much but I liked it prepared like this! * Cook the edamame pods in salted water and remove beans from shell. If they are already shelled, then there is no need to do this. 2. Heat 2 tablespoons of the olive oil on medium heat with the crushed garlic and when you can start to smell the garlic, add the shrimp shells. 3. Saute the shrimp shells until they are golden brown, then add the tomato paste. Be careful not to burn. 4. Add the white wine and scrape the bottom of the saute pan. Once the astringency is gone, taste it and make sure that it is not bitter. 5. Add the heavy cream and bring to a boil. Pour the mixture through a sieve or anything that will filter the shrimp shells. 6. Bring plenty of water to a boil and add enough salt so that you can taste the salt. 7. When it comes to a boil, add the pasta and set your timer for 5 minutes. 8. In a saute pan, heat the rest of the olive oil on medium heat. Add the shrimp and season lightly with salt. Before the shrimp cooks fully, add the eggplant. Add a bit of the pasta cooking water. 9. Add the sauce you made earlier to the saute pan, bring to a simmer, then take off the heat. 10. After 5 minutes of cooking the pasta, taste a strand and drain a little earlier than the desired firmness.